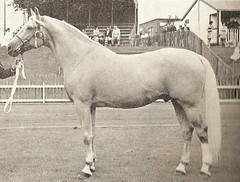 For Kara and anyone interested in golden saddlebreds this was Macks Golden Stepper who was one of the first of the breed imported into the UK in 1966. I brought Highlees Bo-peep from Highlees stud ,and bred carol Ferguson's palomino .Would like to hear from carol . My Palomino's have Macks Golden Stepper in their pedigree. My first Palo Ishtar was by Snow Warning (TB) out of Highlees Bo-Peep who was by Macks Golden Stepper out of Be-Bop of Goldmount.